Background: Mutations in ALK1 cause hereditary haemorrhagic telangiectasia (HHT), whereas mutations in the bone morphogenetic protein type II receptor (BMPR-II) underlie familial pulmonary arterial hypertension (PAH). ALK1 may function as a transforming growth factor receptor in endothelial cells, although when it complexes with BMPR-II, a BMP9 receptor results. BMPR-II may also complex with other type I receptors, conferring selectivity for different BMP ligands. We sought to determine how functional differences in endogenous ALK1 and BMPR-II responses in endothelial cells may explain the different pathologies of HHT and PAH. Methods: Human pulmonary artery endothelial cells (HPAEC) were stimulated with a range of BMP for 1 h for Western blot analysis of Smads and 1, 4 and 8 h for RNA extraction and qPCR analysis. In subsequent experiments, HPAEC were transfected with specific siRNA (siALK1, siALK5, siEndoglin, siActR-II, siBMPR-II, siSmad2, siSmad3, siSmad4) to examine endogenous signalling. After 48 h, cells were then stimulated with BMP9 for 1 h for protein analysis or 8 h for qPCR analysis. Results: BMP9 selectively induced phosphorylation of Smad1/5, Smad2 and Smad3. In addition, BMP9 induced expression of the Id1 and Id2 genes at 4 and 8 h and IL-8 and E-selectin at 8 h. siALK1, but not siALK5 or siEndoglin, abrogated the Smad responses and gene response to BMP9. siBMPR-II reduced the BMP9-mediated Smad1/5 response to a greater extent than siActR-II. Conversely, siActR-II caused a greater abrogation than siBMPR-II of the Smad2 response. Only cotransfection of siActR-II and siBMPRII abolished the Smad 3 response. In addition, cotransfection of siActRII and siBMPR-II was required to abrogate Id gene induction by BMP9. In contrast, siBMPR-II potently abrogated BMP9-mediated induction of IL-8 and E-selectin, whereas siActR-II had little effect, although cotransfection abolished the response. siSmad4 abrogated the induction of the Id genes, IL-8 and E-selectin. However, siSmad2 only abrogated the induction of IL-8 and E-selectin. siSmad3 transfection also led to an enhanced E-selectin response to BMP9. Conclusion: BMPR-II is a key controller of a subset of BMP9 responses (Smad1/5/8, IL8 and E-selectin) through ALK1. The differing consequences of ALK1 and BMPR-II mutations on BMP9 responses in endothelial cells may explain the differences between HHT and PAH. Introduction: Increased oxidative stress has been associated with chronic fibrotic lung diseases such as idiopathic pulmonary fibrosis and posttransplant obliterative bronchiolitis. We have previously shown that oxidative stress can induce epithelial to mesenchymal transition (EMT) in lung epithelial cells in vitro. The mechanism linking oxidative stress to lung remodelling and excessive connective tissue deposition seen in these conditions is unclear. We hypothesised that oxidative stress may drive EMT by upregulating activity of the key growth factor, transforming growth factor beta (TGF-β) in stressed lung epithelia. Methods: Lung epithelial cells (A549) and primary human bronchial epithelial cells (PBEC) were exposed to 400 μmol and 200 μmol hydrogen peroxide, respectively, for 1 h. TGF-β mRNA levels were determined using real-time PCR with GAPDH as endogenous control. The presence of active TGF-β on cell surface and supernatants was assessed using TGF-β bioassay (Tesseur et al. 2006) and TGF-β signalling was inhibited using TGF-β neutralising antibodies, inhibitor of type I receptor (SB-505124) and a Smad3 phosphorylation inhibitor (SIS3). The ability of cells to present TGF-β was determined by beta-6 integrin messenger RNA expression. Results: The 1 h oxidative insult markedly upregulated TGF-β mRNA in A549 cells after 24 h (twofold change compared with untreated control). TGF-β bioassay showed cell surface expression of active TGF-β significantly increased (twofold change, p<0.005) peaking at day 7 posttreatment but no active TGF-β was detected in cell supernatants. These findings suggested a beta-6 integrin-dependent mechanism of TGF-β activation, which was supported by real-time PCR showing twofold upregulation of beta-6 (p<0.05) starting 96 h after oxidative insult. To demonstrate that TGF-β was driving EMT in H2O2 treated cells, three inhibitors of TGF-β signalling were used. Western blot analysis and confocal microscopy confirmed that blocking TGF-β activity with antibodies and signalling via receptor blockade and SMAD inhibition significantly (p<0.05) prevents cells from undergoing EMT. Our data using PBEC support these findings and suggest a similar mechanism could drive fibrosis in the airway. Conclusion: Oxidative stress can induce EMT in lung epithelial cells due to increased expression and activation of TGF-β signalling and provides a potential mechanism for fibrogenesis in the lung microenvironment. Introduction: Secretory leucoprotease inhibitor (SLPI) is produced abundantly by lung epithelial cells and is the key antiprotease defence in the lung. We have previously shown that SLPI levels are lower in posttransplant bronchiolitis obliterans syndrome (BOS) (Anderson et al, Eur Respir J 2008). Pseudomonas aeruginosa (PA) infection often precedes the onset of BOS. We hypothesise that PA infection or elevated levels of transforming growth factor beta 1 (TGF-β1) present in patients with chronic lung disease may cause a protease/antiprotease imbalance by suppressing SLPI. Aims: To investigate the effect of TGF-β1 on SLPI secretion in lung epithelial cells stimulated with clinical isolates of PA.
Materials and Methods: A549 cells were stimulated with standardised stimulants; heat inactivated whole cell PA or heat inactivated PA cell lysate (0–100 μl/ml) in the presence of TGF-β1 (0–10 ng/ml) and the production of SLPI and the pro-inflammatory cytokine IL-8 analysed by ELISA and PCR. The expression of interferon regulatory factor-1 (IRF-1) as a critical factor in SLPI transcription was analysed using confocal microscopy, FACS analysis and Western blotting. Results: A549 cells showed an increase in both IL-8 (12-fold) and SLPI (twofold) production in response to stimulation with either PA preparation. TGF-β1, at doses up to 10 ng/ml, has no suppressive effect on IL-8 production after stimulation with PA (50 μl/ml); however, TGF-β1 induces a dose-dependent suppression of SLPI production and messenger RNA expression after stimulation with PA (returning to baseline with 5 ng/ml of TGF-β1). Stimulation with increasing doses of PA has no effect on cellular IRF-1 expression in A549 cells, yet TGF-β1 (10 ng/ml) alone or in the presence of PA causes a dose-dependent decrease in the expression of IRF-1 (p<0.05, n = 4). Conclusion: TGF-β1 suppresses PA-induced SLPI production in lung epithelial cells but does not affect IL-8 production. This disassociation between SLPI and IL-8 responses favours a protease/antiprotease imbalance due to increased neutrophil recruitment and consequent suppressed lung protection. This phenomenon appears to be regulated via downregulation of IRF-1. Modulating IRF-1 expression may present a therapeutic option for maintaining lung defence in chronic lung disease. Introduction: Ligands of the transforming growth factor beta (TGF-β) superfamily modify cellular protein profiles to regulate numerous cellular and disease-related processes. Coupling of alternative splicing and nonsense-mediated decay (NMD) is emerging as an important mechanism of posttranscriptional gene regulation. We hypothesised that TGF-β ligands such as TGF-β and bone morphogenetic proteins (BMP) may influence alternative splicing. We tested this hypothesis during HHT3 candidate gene studies for hereditary haemorrhagic telangiectasia (HHT), a condition caused by aberrant endothelial cell TGF-β superfamily signalling. Methods: To focus on genes more likely to be directly relevant to HHT, single nucleotide polymorphism mapping was used for HHT3 interval reduction. To test the hypothesis that alternative splicing in endothelial cells (EC) may be influenced by TGF-β superfamily signalling, normal primary human EC from four different vascular beds (affected or unaffected by HHT) were treated with control media, or media supplemented with TGF-β1 or BMP9. Candidate protein expression was examined by confocal microscopy. Candidate gene messenger RNA transcripts were identified following relevant EC cultures in the presence or absence of cycloheximide for the final 3 h, by sequencing reverse transcriptase (RT)–PCR products. For novel mRNA isoforms, bioinformatics sources were used to identify the genomic localisation of previously unknown exons. Results: The HHT3 gene interval was reduced, excluding at least 14 of the 35 genes in the original interval. For one of the interval genes in which protein expression was upregulated in EC after treatment with TGF-β1 and BMP9, RT–PCR generally amplified the expected transcript sequences. However, in some of the cycloheximide-treated control EC, the sole RT–PCR product was derived from a previously undescribed isoform. This contained a novel exon (CF1), which is not found in any standard transcript databases, nor in alternative splicing data generated by extensive EST-based gene-modelling algorithms. In keeping with the detection of the novel isoform only in cycloheximide-treated EC, inclusion of exon CF1 introduced a premature termination codon predicted to lead to NMD. Conclusions: We hypothesise that TGF-β superfamily signalling may regulate endothelial cell gene expression partly by modulating alternative splicing and NMD. Neutrophil apoptosis is essential for the orderly resolution of granulocytic inflammation but can be prevented by agents such as granulocyte macrophage colony-stimulating factor (GM-CSF) and tumour necrosis factor alpha (TNFα). Members of the pro and anti-apoptotic Bcl-2-family act as key regulators of cell fate and allow cells to respond to a variety of adverse environmental conditions. The activity of these proteins is controlled at several levels including transcription/translation, homo and heterodimerisation, phosphorylation and degradation via proteasomal and caspase-dependent pathways. 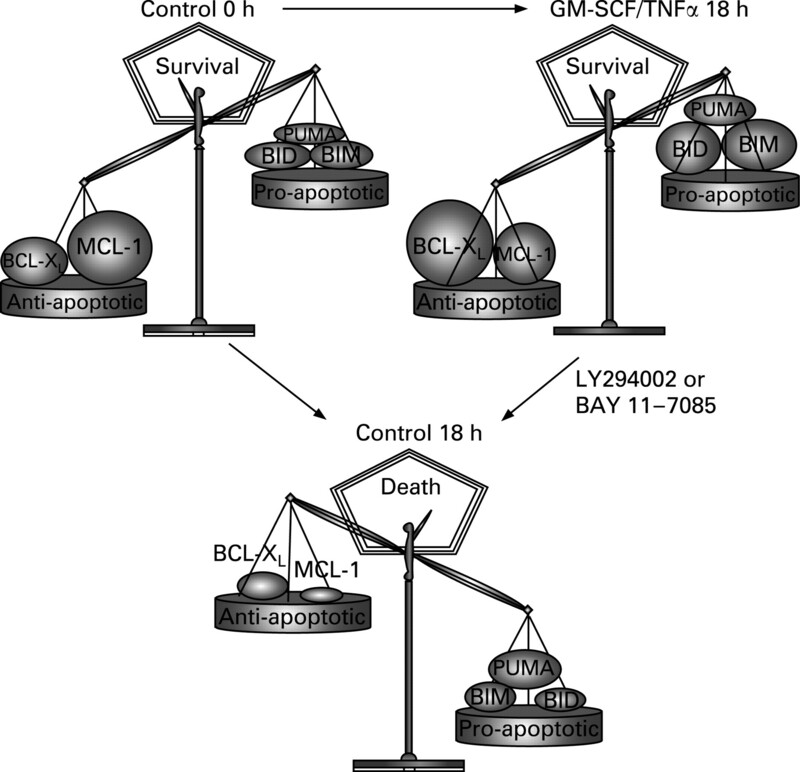 In the context of such a short-lived and terminally differentiated cell as the neutrophil it has hitherto been uncertain whether inflammatory agents such as GM-CSF and TNFα have the capacity to modulate apoptosis through transcriptional/translational control of anti-death (Bcl-XL, Mcl-1 and Bcl2A1) and activator BH3-only (Bim, Bid and Puma) Bcl2 family members. Peripheral blood neutrophils were isolated by dextran sedimentation followed by discontinuous percoll gradients. Cells were cultured for 0–18 h with/without GM-CSF (10 ng/ml) or TNFα (10 ng/ml), gene expression was analysed by quantitative PCR and normalised to five house-keeping genes, protein expression was analysed by Western blotting. Here we demonstrate that GM-CSF and TNFα prevent the normal time-dependent loss in Bcl2A1 in human neutrophils, whereas GM-CSF also causes a major nuclear factor kappa B (NF-κB)-dependent increase in Bcl-XL transcription. Protein expression was shown to mirror the changes in messenger RNA abundance. In addition, GM-CSF and TNFα decreased the normal time-dependent loss of Mcl-1. Surprisingly, GM-CSF and TNFα also increased and maintained mRNA levels of the pro-apoptotic BH3-only protein Bid, while GM-CSF had a similar effect on Bim transcription; this latter event was particularly apparent after inhibition of PI3-kinase. The induction of Bid by TNFα and the induction of Bim by GM-CSF were both NF-κB-dependent. Protein expression again followed changes in mRNA: both cytokines enhanced expression of BimEL (8 h) and Bid (12 h) and TNFα enhanced BimL expression (4–8 h). Expression of Puma, Bax and Bak was unaffected by GM-CSF or TNFα at both mRNA and protein level. This is the first study to examine the effects of survival factors on this repertoire of Bcl-2 family members in human neutrophils and reveals an important role for NF-κB and PI3-kinase-dependent transcriptional regulation. Rationale: Retinoic acid (RA) is required for normal developmental alveolar septation. Signalling via RA receptor (RAR) isoforms α, β and γ has differential effects on alveologenesis. RARβ has an inhibitory effect: RARβ-/- mice show premature postnatal alveolar septation. RARβ may also play a role in adult alveolar maintenance programmes. We have used alveolar morphology and waking unrestrained whole body plethysmography (WBP) to assess adult lung phenotype in RARβ-/- mice. Method: RARβ-/- and wild-type (WT) C57BL/6 mice were observed by WBP with hypercapnic challenge at 12–14 weeks of age. Mice were then killed and alveolar morphology assessed (mean chord length (Lm), surface area (SA), lung volume (LV)). Results: RARβ-/- mice showed significantly reduced minute volume (MV) achieved by smaller tidal volume (TV), reduced inspiratory and expiratory flows (PIf, PEf), increased inspiratory and expiratory times (tI, tE) and a slower respiratory rate (f) compared with WT (p<0.05 all parameters). Central respiratory drive (TV/tI) was significantly lower in RARβ-/- mice. Morphometry showed smaller Lm (p = 0.049) and greater SA/LV (p = 0.025) and SA/100 g (p = 0.045) in RARβ-/- mice compared with WT. Significantly greater SA/100 g body weight and consistent changes in WBP (lower TV/tI, smaller MV, smaller TV and lower PIf and PEf) were also detected in female WT mice compared with males, but this sexual dimorphism was not present in RARβ-/- mice. Conclusion: Adult RARβ-/- mice have smaller alveoli with greater body mass-specific SA, lower central respiratory drive and take smaller, slower breaths to give a lower MV under CO2 challenge compared with WT. These findings are consistent with adaptation of automatic ventilatory control to better gas exchanging capacity. RARβ may play a hitherto unrecognised role in oestrogen-driven mechanisms that increase body mass-specific alveolar SA in females during sexual maturation to prepare for the metabolic demands of future pregnancy. WBP offers a functionally meaningful, sensitive and repeatable in vivo assay for changes in the alveolar gas exchange SA.